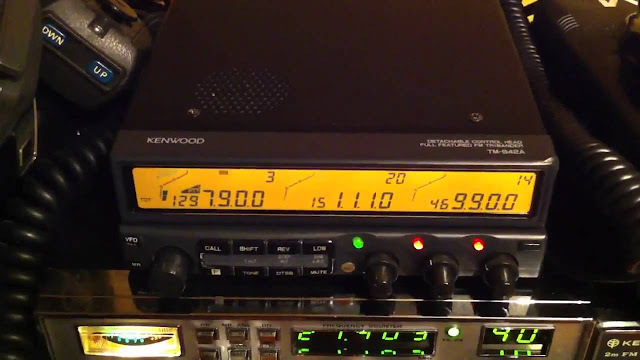 Kenwood TM-942 This model comes with 2 meters and 440 built-in. Modular construction allows you to add your choice of another single band: 28, 50, 220 or 1200 MHz. Any two bands can be chosen for cross-band repeater use. This deluxe radio comes standard with 144 and 440 MHz. The improved detachable front panel allows the radio to be mounted elsewhere in your vehicle (with optional DFK-3/4/7). This latest "D" version features the MC-53DM backlit hand mic. The antenna jacks are pig tail type (including the optional antenna if applicable). Size: 6 x 2 x 7 inches 3.3 lbs. (150x50x175mm 1.5 kg).